Reiji shows up with a King of Fighters invitation at the home of Kyo Kusanagi, who is living in America. As a representative for Chizuru, he asks Kyo to join him as his teammate in the championship competition so that they can investigate the waves of mystery that are interfering with the "Orochi" seal. For some time, Reiji was rumored to be Chizuru's husband; however, they are actually just friends, and representatives of the same clan. This is why Reiji's daughter is dressed in a similar outfit to Chizuru. Plus he's probably married to someone else. 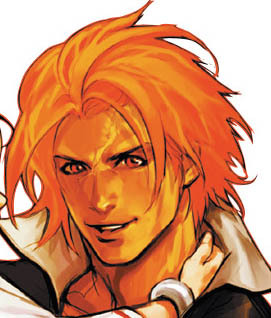 Reiji's got a pretty cool outfit and seems to fit right into KOF with his "pretty boy" face. His fighting style is one of the better styles out of the new characters to debut in the KOF EX series, but he's obviously very under-developed as a design.